The Jersey Shore Boca men’s open team, including former Toms River East and Richard Stockton College standout Brian Hutterman (pictured), will look to capture the New Jersey Amateur Cup this Sunday as they host the German American Kickers (GAK) in the championship game which kicks-off at 6pm at the Eastern Soccer Complex in Berkeley Township with the winner advancing to the 2006 USASA Regional Tournament. 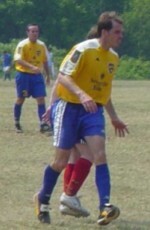 TOMS RIVER, NJ (March 16, 2006) – The Jersey Shore Boca men’s open team will look to capture the New Jersey Amateur Cup this Sunday as they host the German American Kickers (GAK) in the championship game which kicks-off at 6pm at the Eastern Soccer Complex in Berkeley Township. The New Jersey Amateur Cup champion will advance to United States Adult Soccer Association (USASA) Regional Tournament later this spring for a chance to advance to the 2006 USASA National Amateur Cup this summer. The Boca men hold an overall record of 4-4-1 this season heading into Sunday’s championship game which includes a 5-1 win over the Parsippany Soccer Club back on November 4th in the NJ Amateur Cup semi-final round. The team is currently in fifth place out of ten teams in South Group of the Garden State Soccer League’s Semi-Pro Elite Division. Lithuanian born Thomas Bannionis (Berkeley Township), the team’s MVP high-scoring forward from a year ago, leads Boca in scoring with 8 goals so far this year. Jamie Nelson (Toms River), a former standout at Richard Stockton College and 2000 Toms River North graduate follows with 5 goals. Former Shore area players Ryan Applegate of Central Regional (’94) – Rowan University and Christian Treney of Toms River East (’94) – Methodist College are player-coaches of the team. Jim Dellpietro (Lacey’92 – Bloomfield College), Chris Auriano (Toms River North ’00 – William Paterson University), Moses Mingle (St. Raymond’s ’95 – FDU Teaneck) as well as long-time Boca veteran Eddie Decker (Toms River East ‘88 – East Stroudsburg University), who played professionally with the NJ Stallions of the USL and with Boca’s PDL team in 2003. New additions to the Boca men’s open team this year that are also making their presence felt are Justin Fuccello (Brick), Frank Guacdascione (Manchester), and Oren Solon (Bayville) who all played for the Boca U23 team last summer in the Mid-Atlantic Summer Showcase League. Other roster newcomers include former Rutgers University standout Donny Gray (Toms River) and former Richard Stockton star Ken Masuhr (Island Heights) along with Art Shatterwhite (Somerset) and Kevin Hartwyk (Washington Twp) who recently completed their college eligibility at Monmouth University. The Club is celebrating their 28th year of existence in 2006.